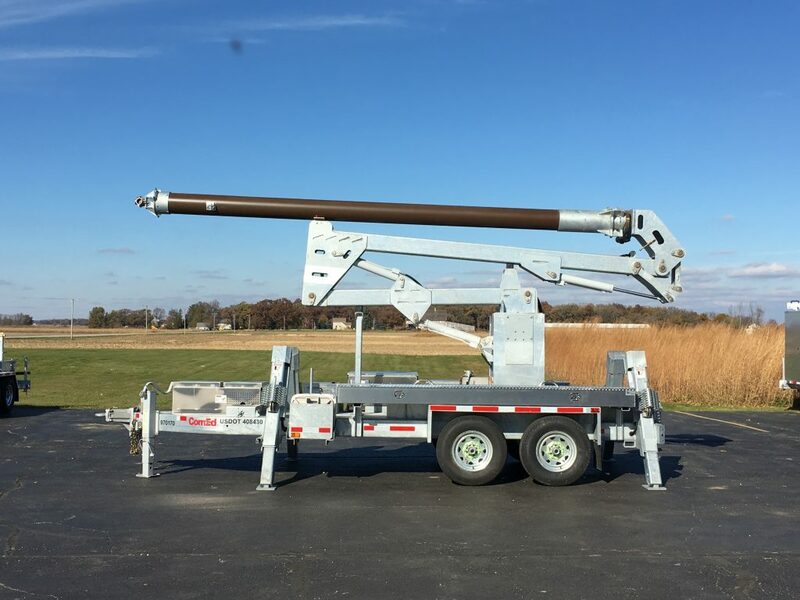 Model 1572 Rapid Overhead Deployment Trailer - Sauber Mfg. 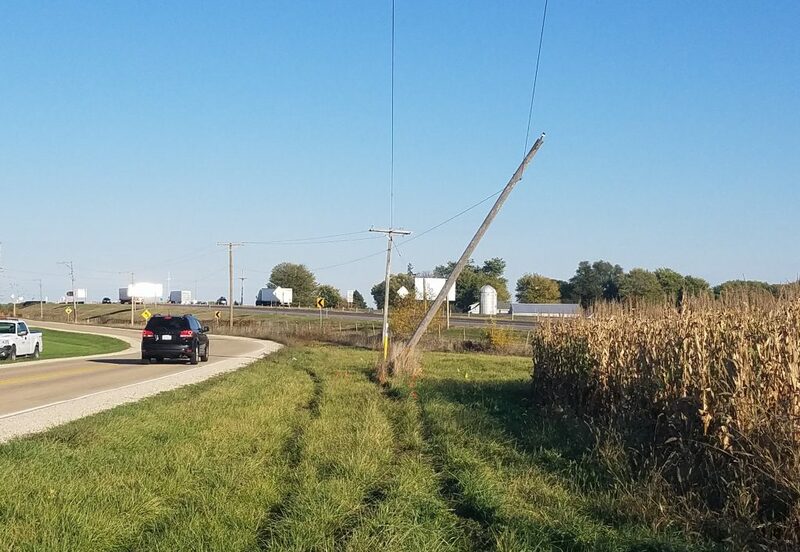 Co.
Can be towed by a 1 ton pickup. Can be charged exclusively from line power, on-board provided generator or a combination of the two. Significant reduction of (CAIDI) Customer Average Interruption Duration Index. 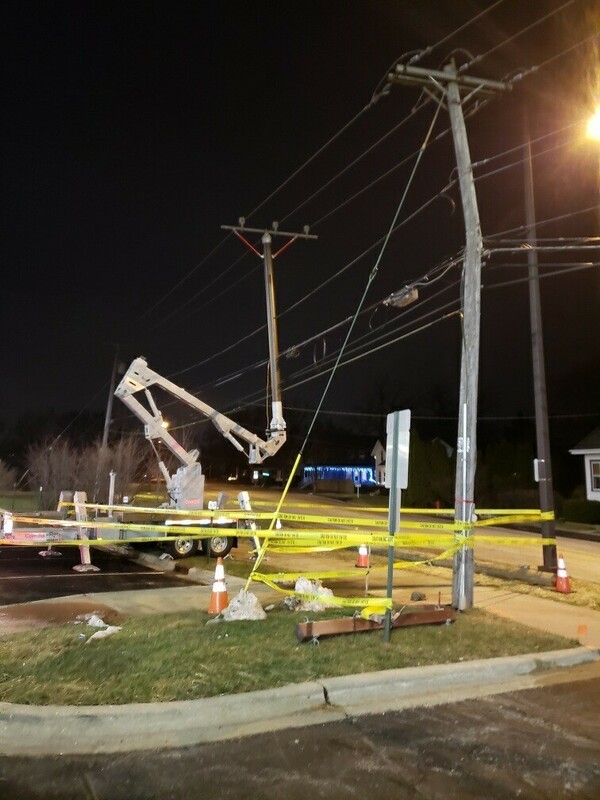 Smaller crew size for initial restore operation while finishing permanent repairs on the next available shift rather than calling crews out after hours to work on replacing a broken pole in the dark, inclimate weather, or in areas of high traffic in order to restore all customers impacted. 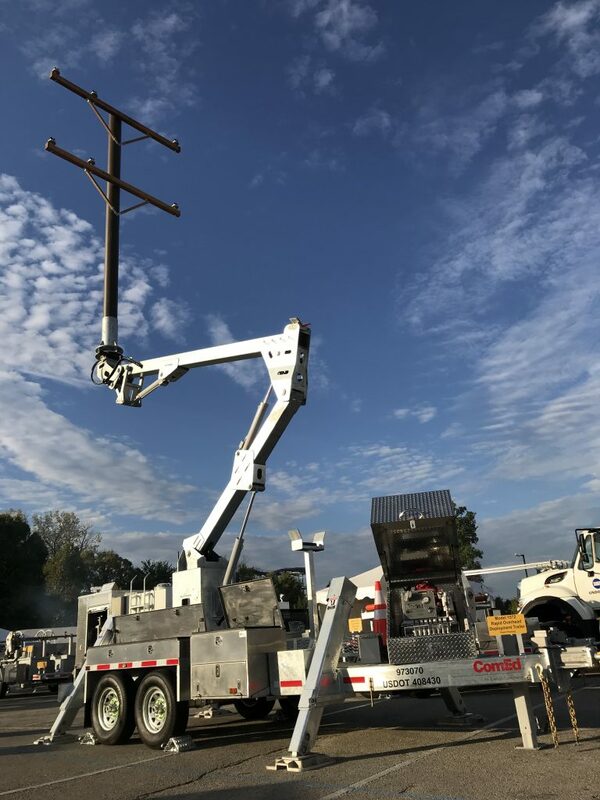 Eliminates wait times required for multi-step pole replacement involving utility location services, site prep & material gathering. 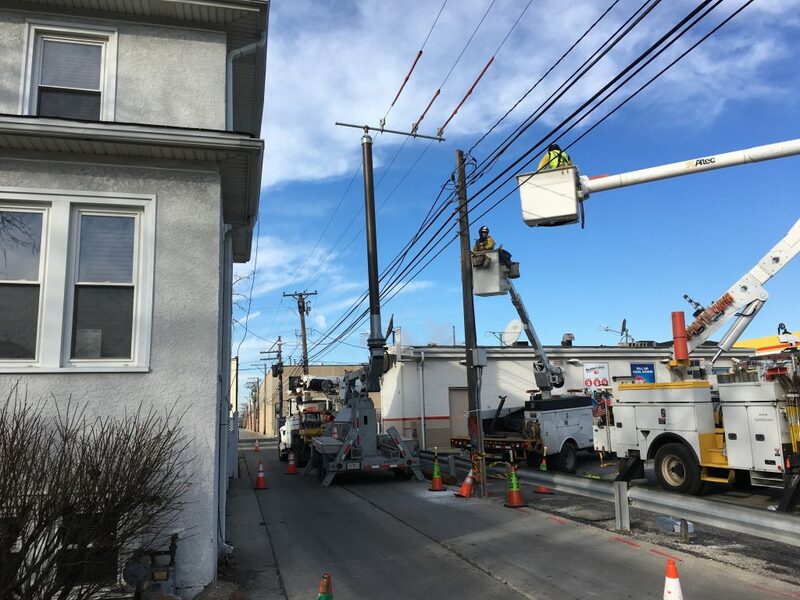 Permanent replacement can be accomplished during regular time windows with less stress on the utility, its people, equipment and other resources. 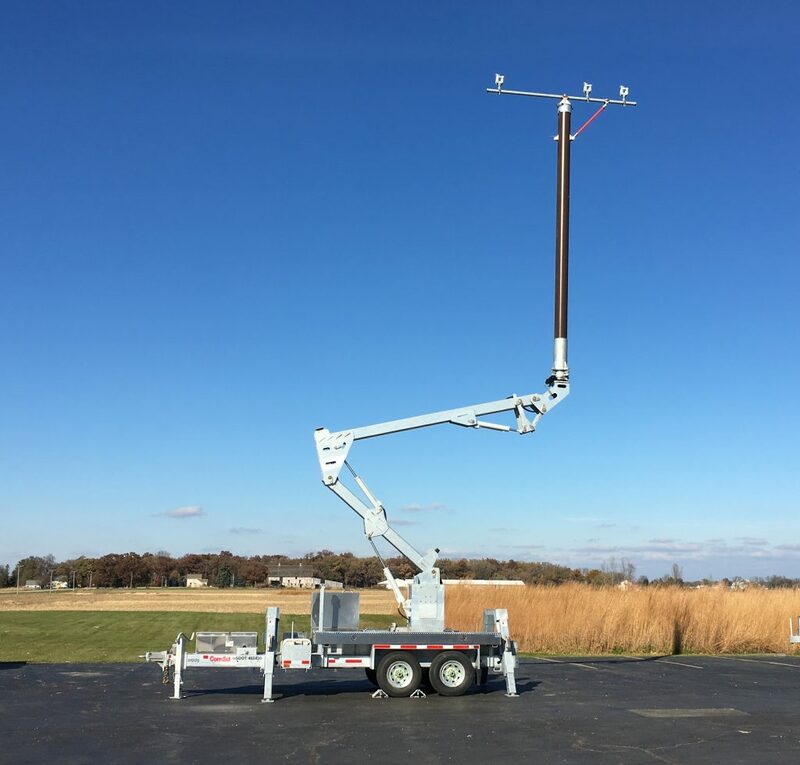 Has the unique potential to protect physical property, livestock and people by minimizing outage durations. 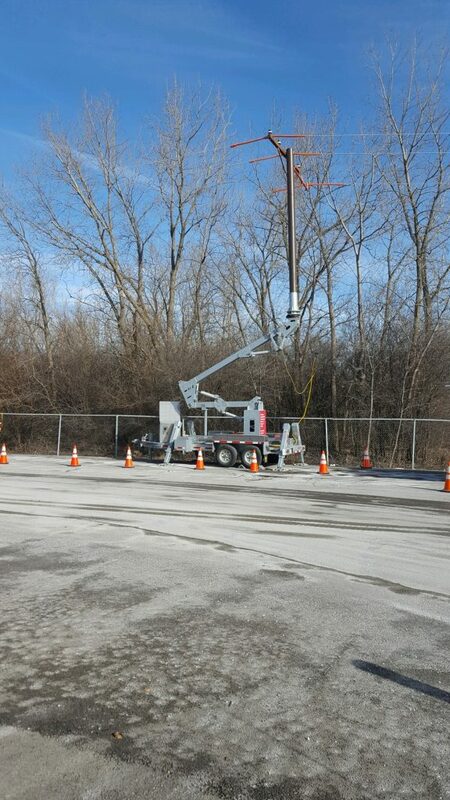 Faster pole vs. vehicle cleanup time = open roadways. 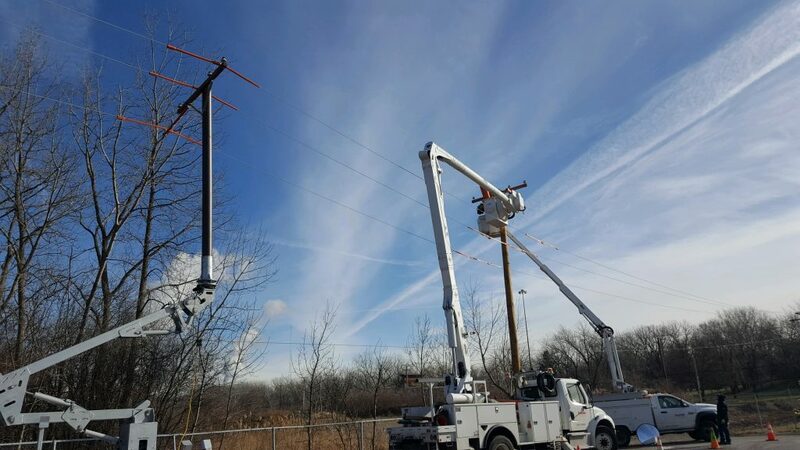 With multiple staged units, crews will have the tools to reduce outage durations across the system as well as improve efficiency during routine maintenance. 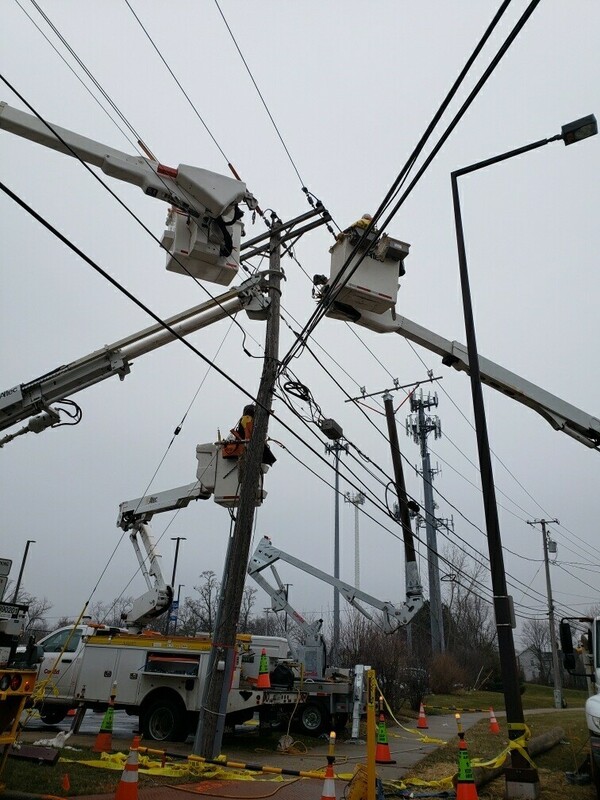 Storm response teams will have the ability to deploy where pole damage is most significant. Lowers costs for RIP (Replace In Place) jobs. 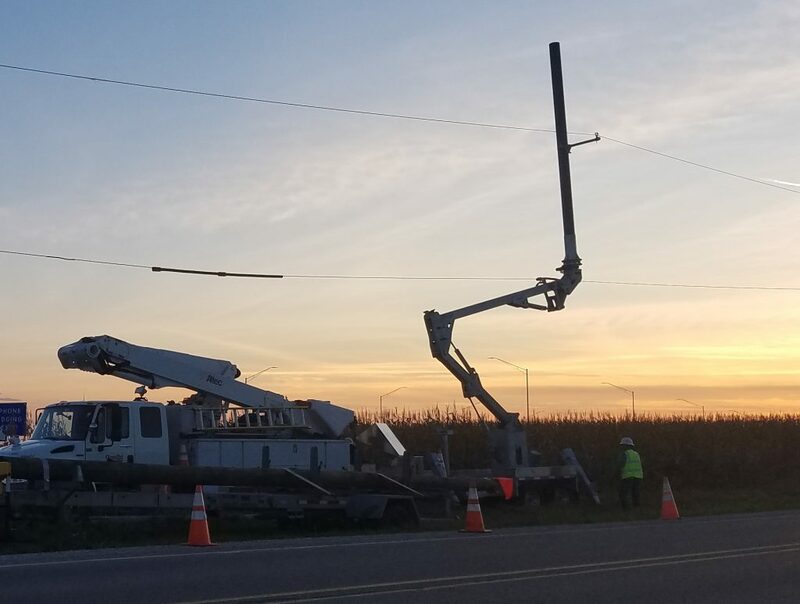 Reduce outage duration and improve customer satisfaction through continued low electric delivery rates by reducing operating costs. 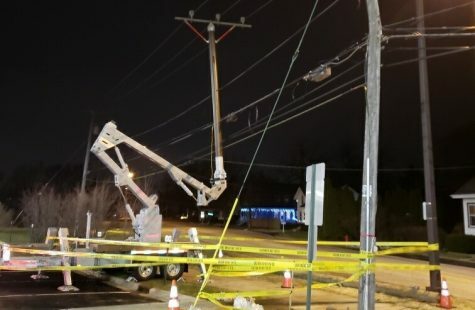 Can be used at intersection crossings to support new or replacement conductor installation. 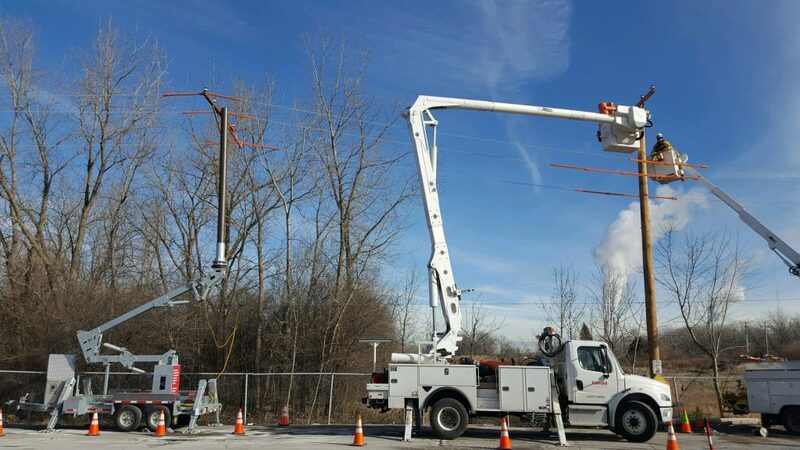 Allows temporary bypass for electrical equipment replacement or inspection at substations. 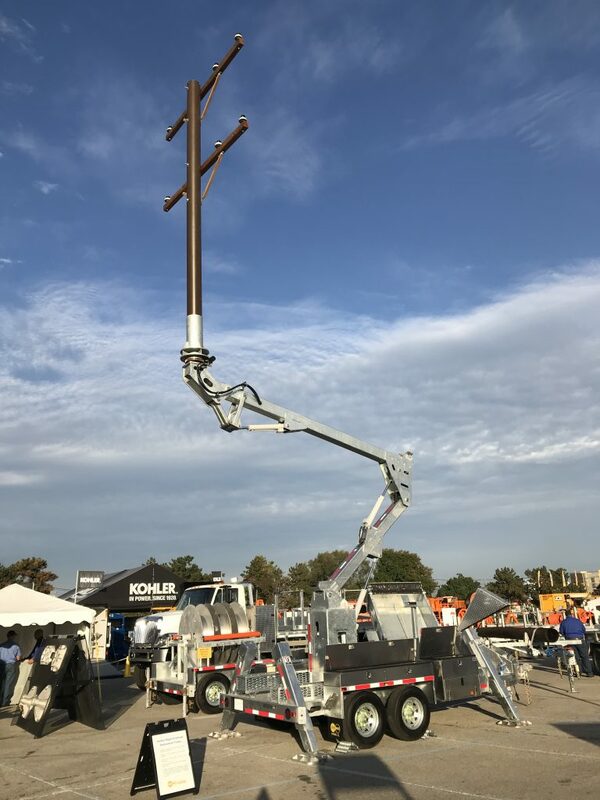 Fractional investment compared to a line truck with much lower maintenance and licensing costs with a vastly greater economical service life. 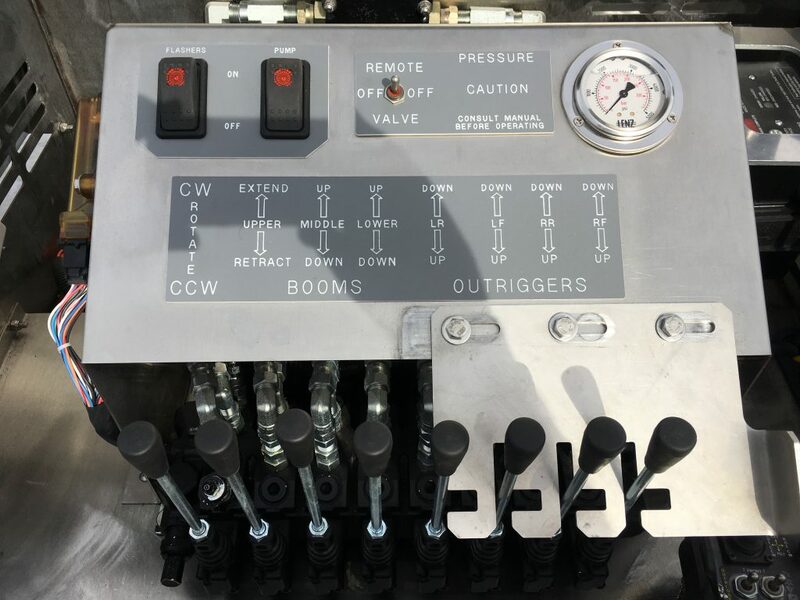 Wireless and ground controls both provide full feathering on all functions allowing the operator maximum visibility during deployment and fold for travel operations while providing for backup/manual operation at the valve bank. 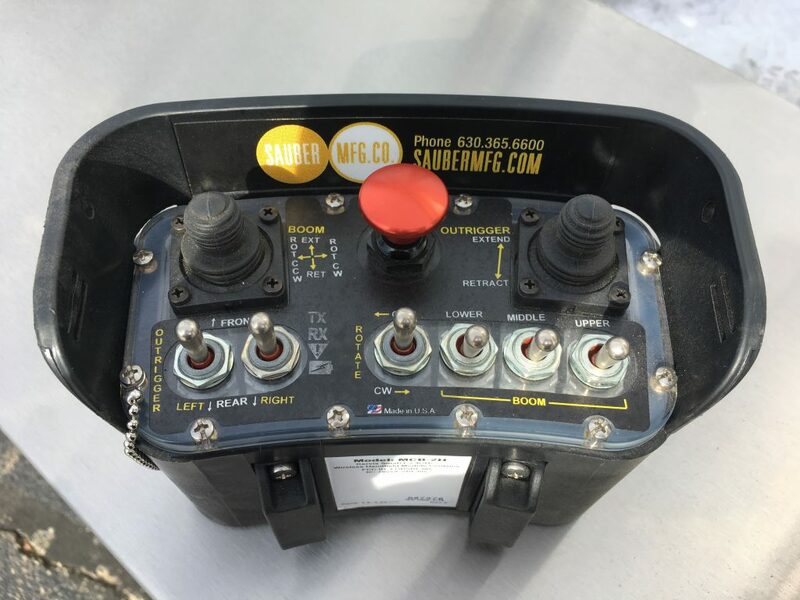 Wireless controls require simple dual switch movement for all functions to prevent unintentional actuation. 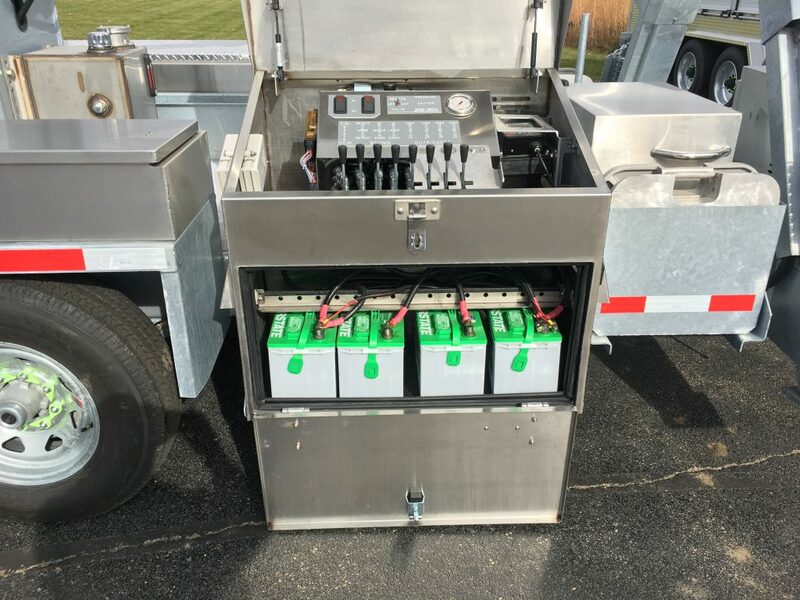 24VDC Power unit provides 2500 PSI @ 3 GPM; (4) 660 CCA deep cycle batteries w/ fully automatic battery charger w/ percent charged & volt indicators. Generac iQ2000 1600W inverter generator w/ 3 power delivery speeds; LED dashboard w/ fuel level, remaining run time; output indicator; 9.4 hours runtime @ 1/4 load. Fully charged, new battery pack provides 5 full deployments from setup to fully folded/travel ready @ 60° ambient. 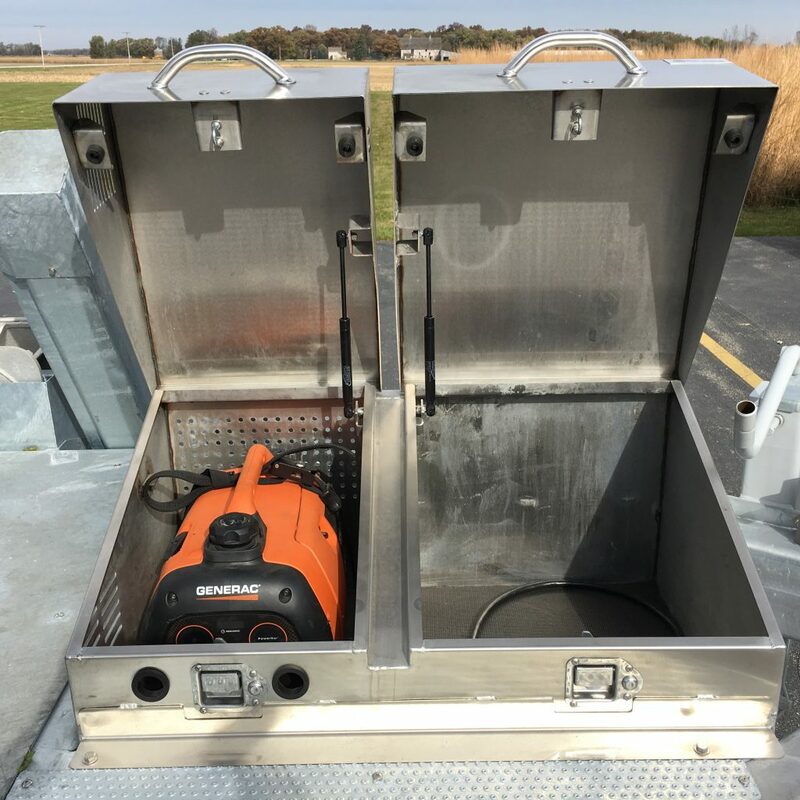 Lockable, vented stainless steel generator cabinet. 2.5 Gallon safety gas can w/ lockable stainless steel box. Battery pack can be charged from shore power or onboard generator as needed. 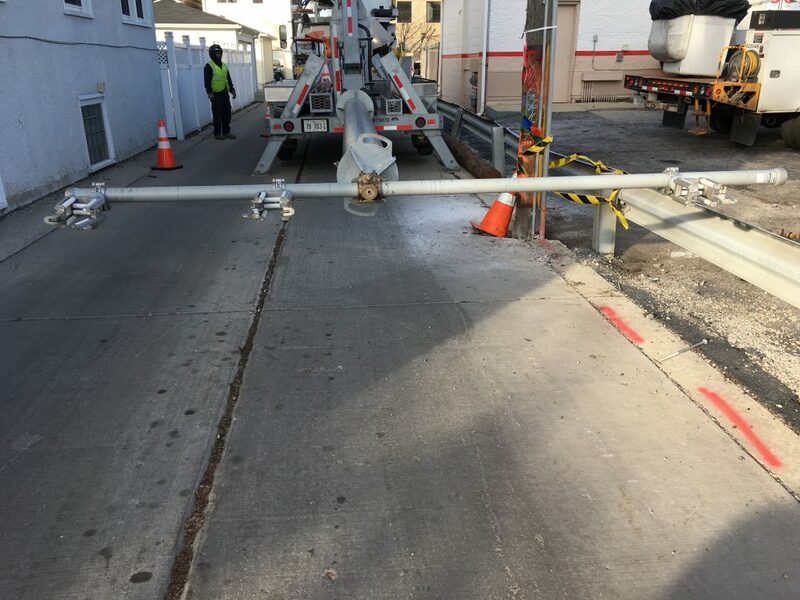 (4) Telescoping hydraulic outriggers w/ counterbalance valves. (4) Almag flat and (2) tapered outrigger pads provided w/ storage provision. 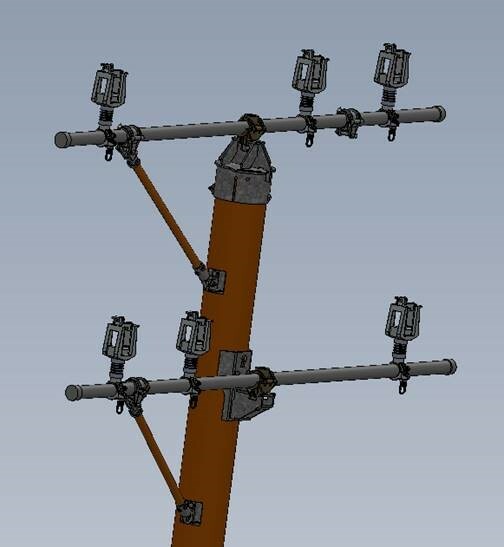 (3) Hydraulically actuated boom cylinders w/ counterbalance valves. 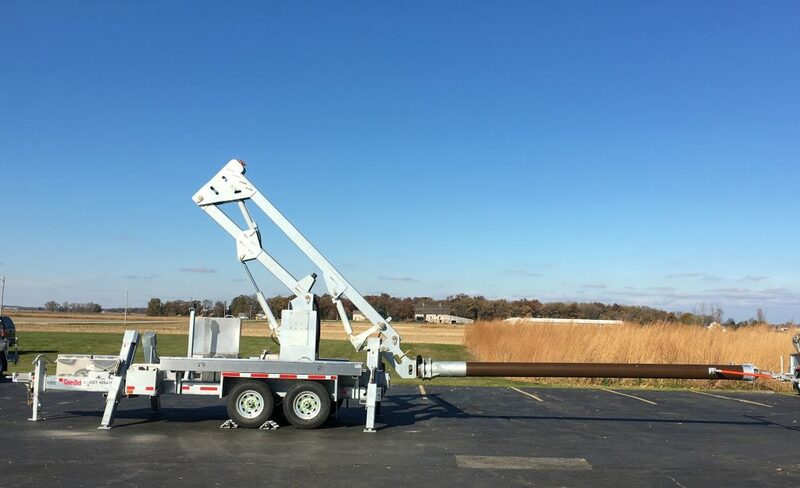 18’L x 10″Dia third stage fiberglass pultrusion boom w/ continuous rotation for clocking crossarm positioning relative to wire path. Self-locking worm drive turntable bearing w/ hydraulic motor at base of third stage boom. Designed and tested to 21,778 ft-lb moment load. 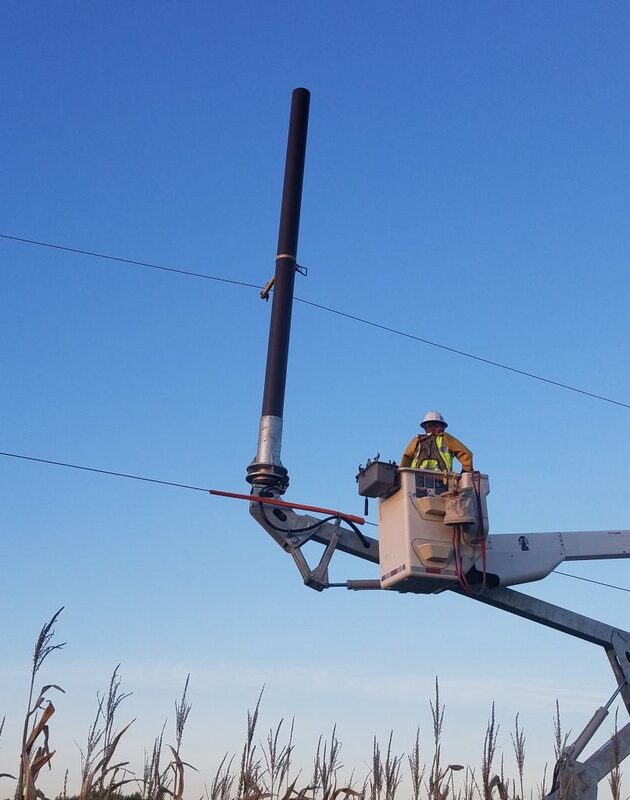 Separate relief setting on third stage boom rotation protects connected wire & cable from accidental damage. Intelligent 12VDC warning light system utilize existing FMVSS tail and marker light circuit. 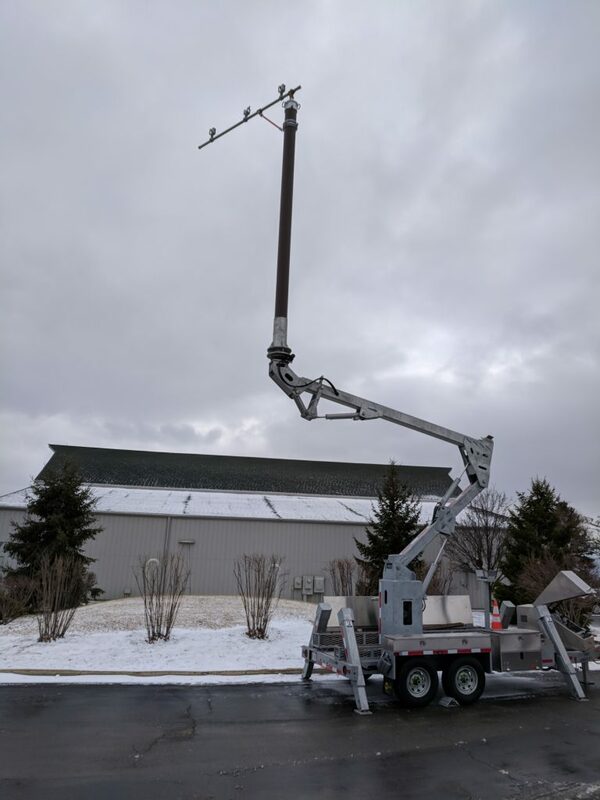 10′ Crossarm open basket w/ drop down door – LS load area. 4′ Support arm basket – RS load area. Lockable stainless steel tool box – front tongue. Lockable stainless steel, dual compartment tool box houses battery system, valve bank & control panel – RS front of fender. 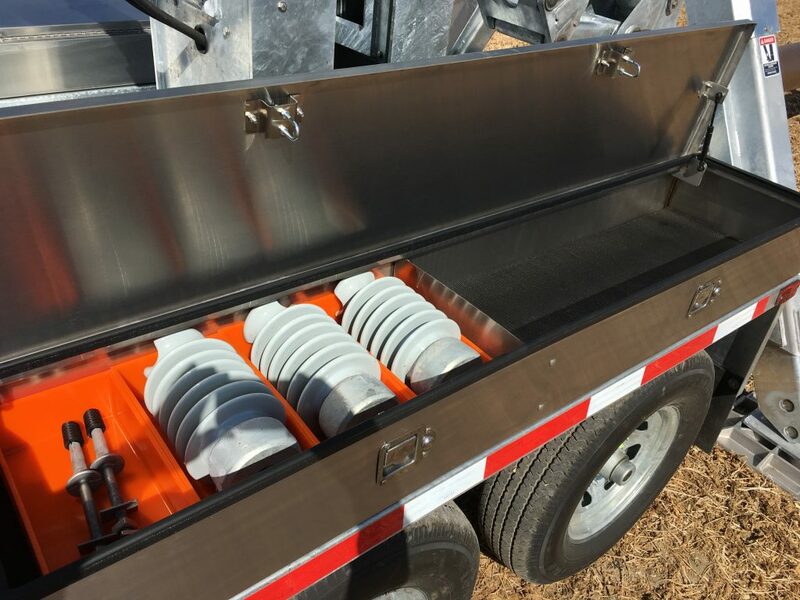 Lockable stainless steel tool boxes w/ gas shocks & rubber lined bottoms – LS & RS fenders. LS Box equipped w/ urethane insulator compartments to protect insulators during travel and storage – (3) 13″L x 6.75″W x 3.35″D & (8) 5.75″L x 5.75″W x 3.5″D. Stainless steel pivot pins and Oillite bushings provided at all pivot points; no greasing required. 4″x8″ Bent tubing frame w/ bolt on 3/16″ smooth galvanized floor and 8″ rear bumper tube. 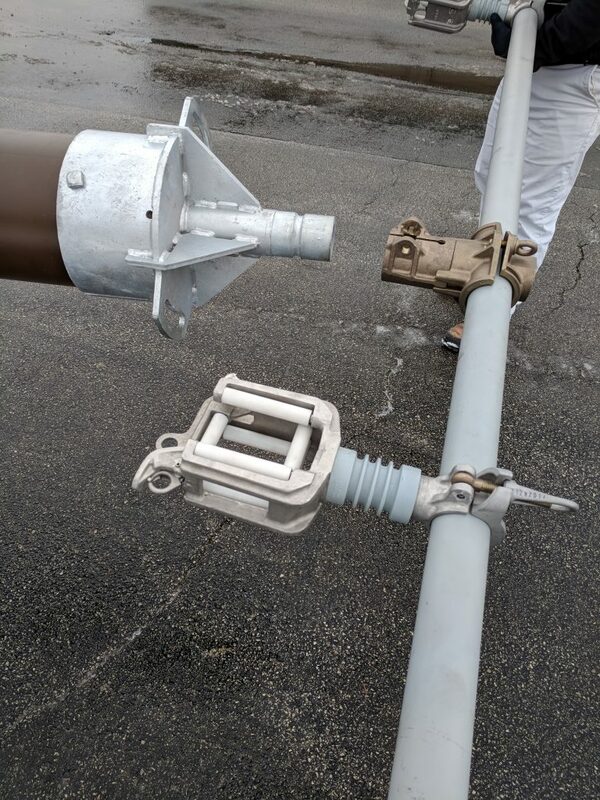 (2) 5/8″ x 5″ Aluminum bronze grounding lugs; (1) right rear frame; (1) 3rd stage boom base. Electric brakes and sealed breakaway w/ visual check indicator light. (2) 7K Dual Torflex galvanized undercarriage. LED FMVSS Plug-N-Play trailer lighting w/ sealed harness system and 7-way socket w/ Almag socket housing protection. 52″L Non-metallic 7-way SAE cord. 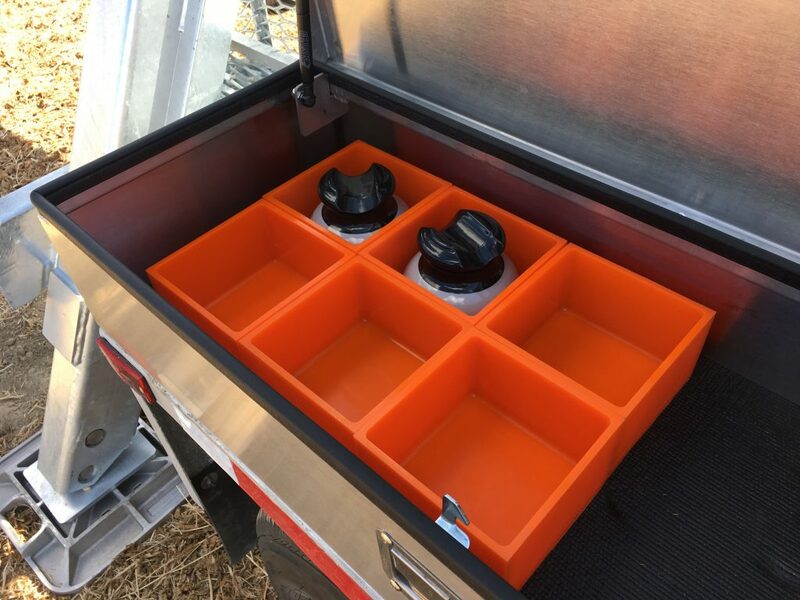 (2) Xenoy weatherproof containers; (1) inside lockable valve compartment for tool box keys and spare remote batteries; (1) provided for registration storage. Zinc plated, grade-70 3/8” chain rated at 26,400 lbs breaking strength extending 23” beyond pintle eye. Zinc plated, grade-70 clevis hook w/ safety latch rated at 26,400 lbs breaking strength. 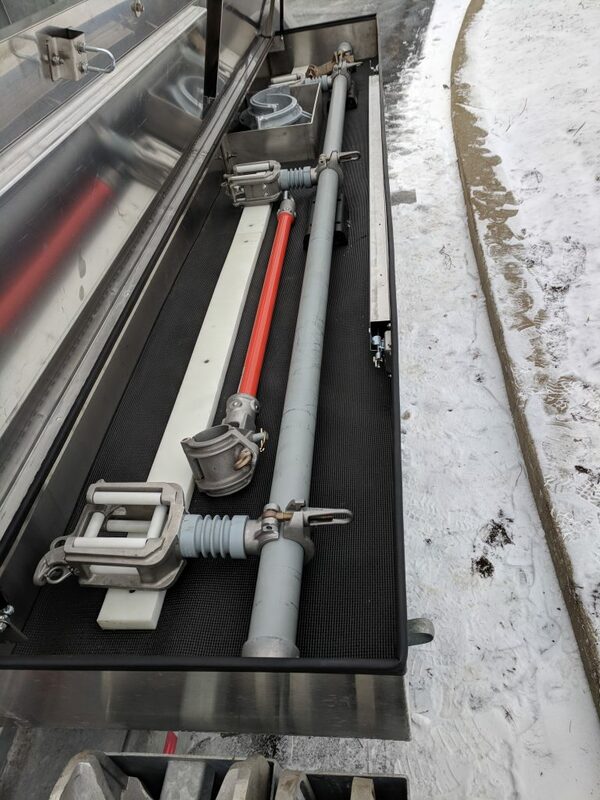 Assembly connected via 3”x3”x3/8” wall tubing continuously welded to trailer frame w/ inverted crucifix and 3/4”-10 grade-8 fastener w/ SAE high strength washer and lock nut securing chain in crucifix. 3” I.D. – 60,000 lbs capacity pintle eye w/ 11″ heat treated, cast steel adjustable and reversible extension. Hitch and extension hot-dipped galvanized and installed w/ grade-8 fasteners & lock nuts. 3″ Drawbar lock ring w/ (2) keys. 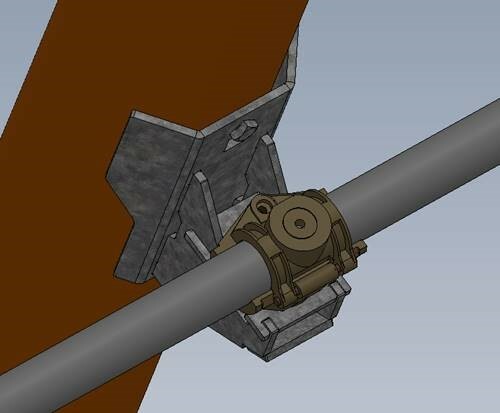 17201 Spring loaded drop-leg jack – center mounted. 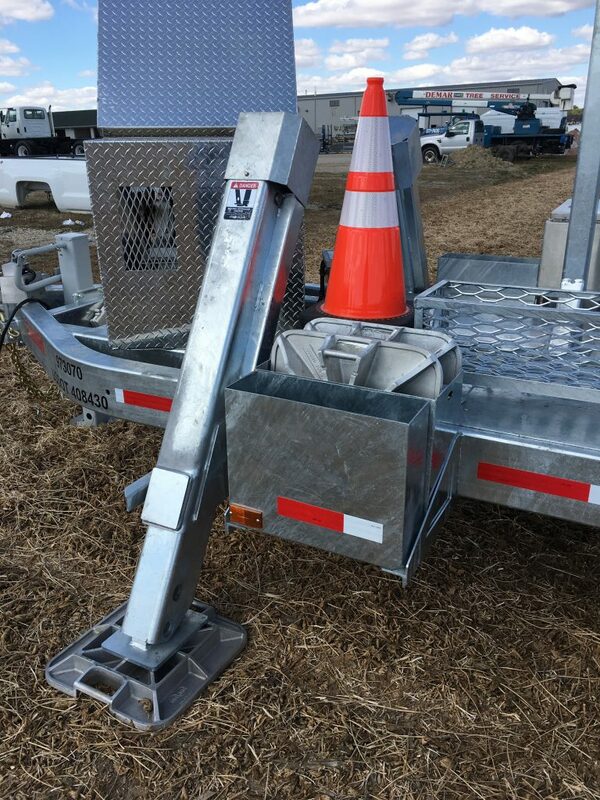 12-Gauge Fenders with 1″ lip return and mud flaps. Fasteners: Bolts under ½”: Stainless steel; ½” and Above: Zinc-plated Grade 8; lock nuts used exclusively. Hot-Dip galvanized finish w/ galvanized wheels; accessories gray. 10-year structural, parts & labor on all Sauber-manufactured components. 3-year total parts & labor coverage.